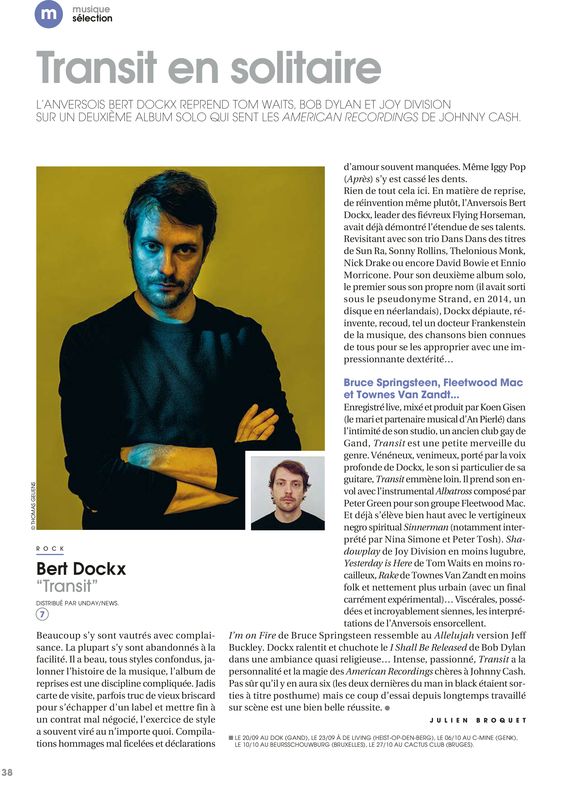 With his new solo album "Transit" (the first since his album “Strand”, featuring all songs in Dutch), the inexhaustible Bert Dockx has added a compelling new facet to his ever-expanding, deeply personal musical universe. 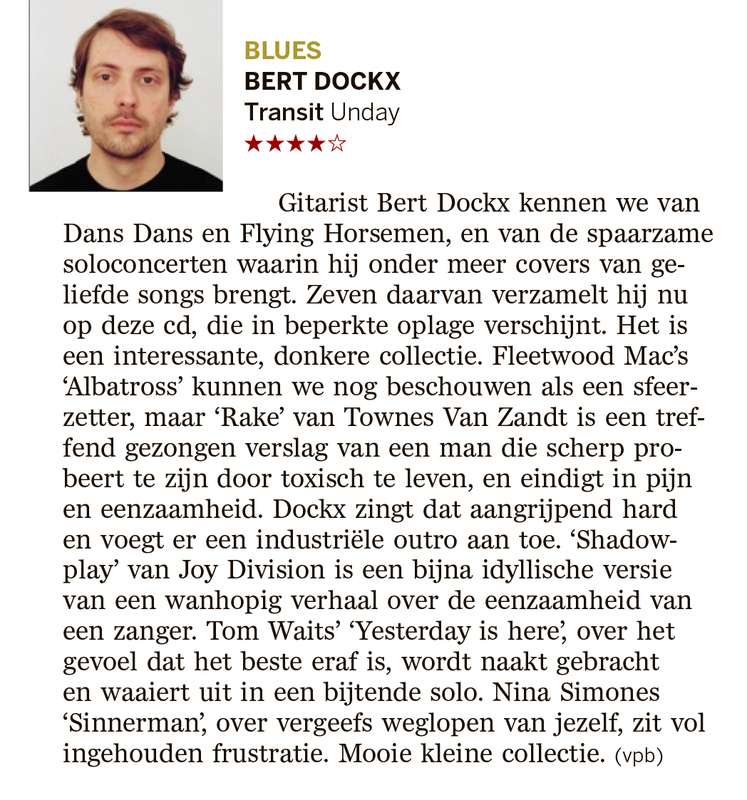 While in the past decade Bert’s main projects – Flying Horseman and Dans Dans – have grown into two of the most eminent and devotedly followed bands in Belgium, he has always kept playing solo-shows on the side. Shows at which, along with his own compositions, he has occasionally offered adventurous interpretations of a variety of iconic songs. 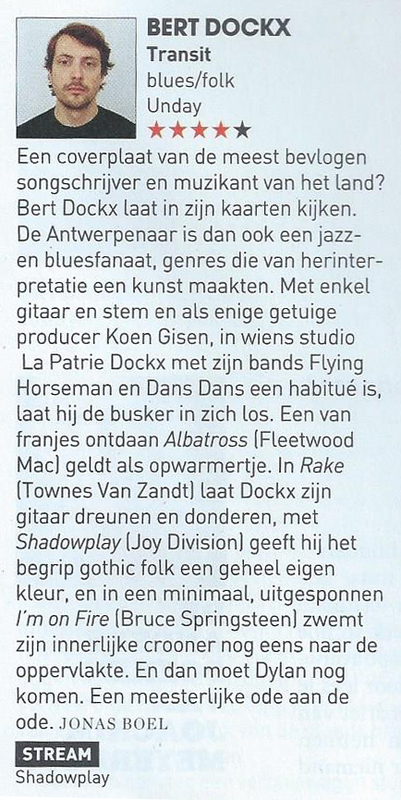 Transit contains the most remarkable of these interpretations in a naked and raw, yet subtly hallucinogenic production by Dockx’ faithful accomplice Koen Gisen. The album was recorded live (and captured on camera by Philippe Werkers) in Gisen’s intimate studio in Ghent, Belgium. As we've come to expect from this always original musician, these are anything but servile ‘covers’. 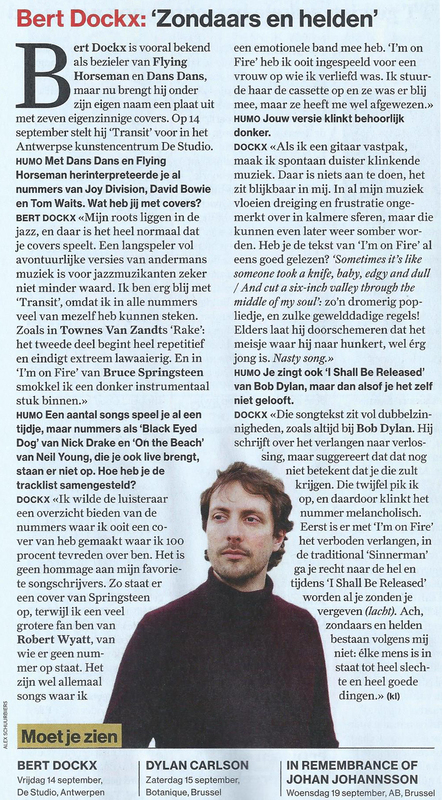 In often unexpected ways, Dockx gives a voice to the deep connection he feels with this music. He pays tribute to the original song by radically making it his own. 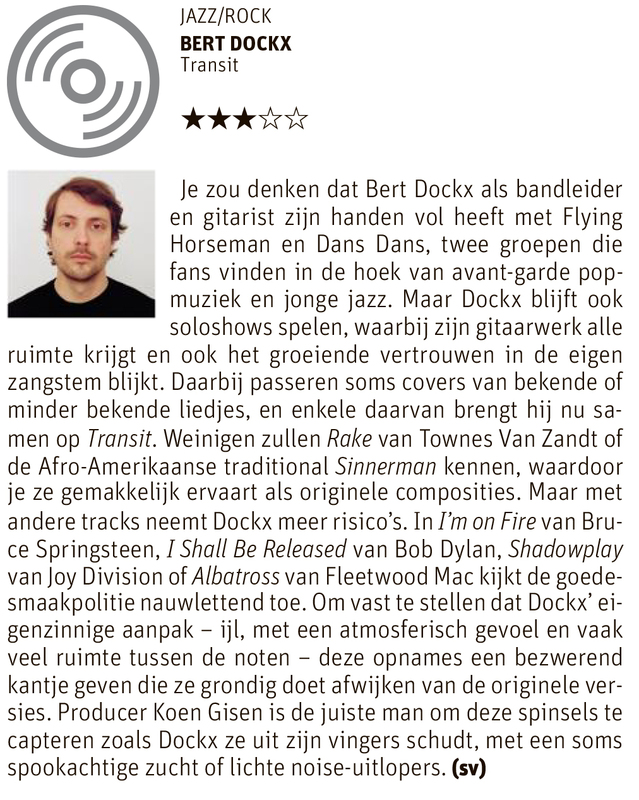 With his intuitive, genre-defying approach, Dockx exposes unknown layers and emotions in often overfamiliar songs (Albatross by Fleetwood Mac, I’m On Fire by Bruce Springsteen, I Shall Be Released by Bob Dylan), offering us glimpses beneath the surface of his own soul in the process. 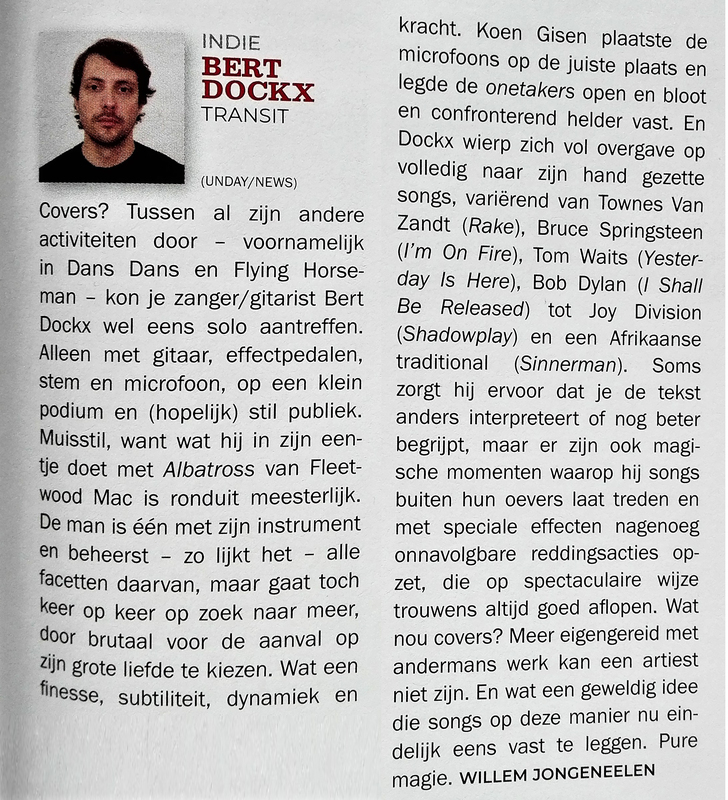 Anyone who has seen Bert Dockx perform with Flying Horseman or Dans Dans, will know how riveting and atmospheric his performances can be. Impassioned vocals, intense presence, fierce and inspired guitar playing, room for improvisation, the ecstatic heat of the moment. 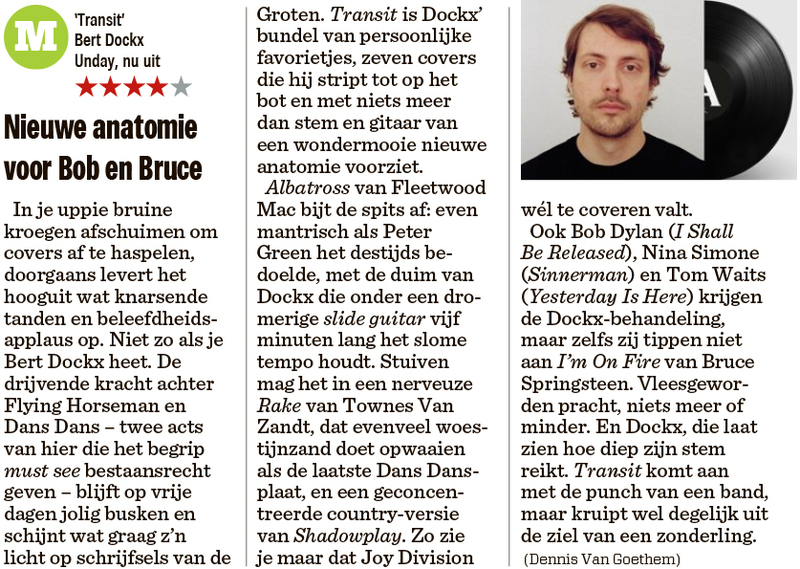 "Pure Magic" OOR on "Transit"
Nice review by GVA on "Transit"
"Intense, passionate,..." FOCUS VIF on "Transit"
Completely executed according to the "day-for-night" principle. 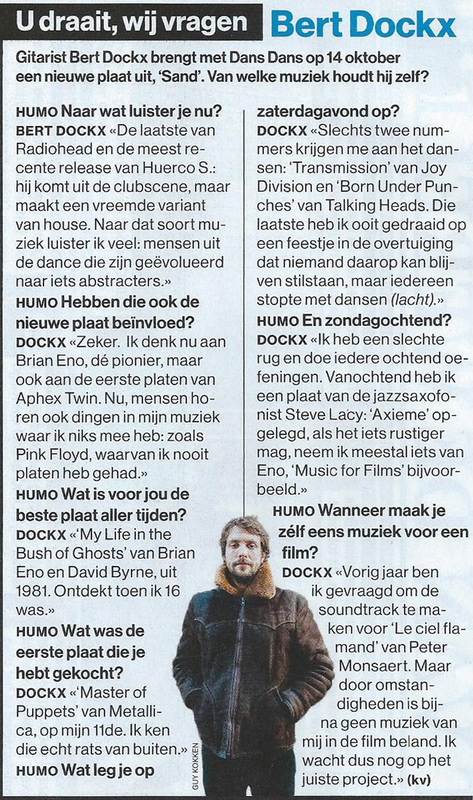 ENOLA on "Transit"
"Raw & Honest" LUMINOUS DASH on "Transit"